Medical devices such as stents, catheters, and heart valves need to be resistant to corrosion to avoid adverse effects after deployment in the human body. Optimization of the medical device corrosion resistance is therefore critical. Furthermore, supporting data that a medical device is sufficiently resistant to corrosion is required by the FDA for approval of the device. Auger Electron Spectroscopy enables both measurement of the surface oxide layer thickness and investigation of the oxide layer uniformity of electropolished medical devices. Auger can be used to provide representative data from the entire device or localized data to highlight differences between various areas on the surface(s) of interest. Figure 1 shows a typical Auger Depth Profile. 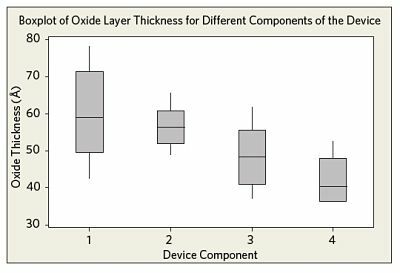 Figure 2 shows the oxide layer thicknesses, as measured from different components of several medical device samples after electropolishing. 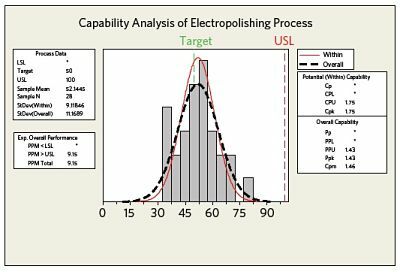 While some minor differences are observed between the components, the overall uniformity of the electropolishing process is satisfactory. Figure 2 Oxide layer thicknesses measured for different components of the device after electropolishing. Figure 3 summarizes the observed process capability and compares the within subgroup variation (data from within the different areas of the device) to the overall process variation. In this case only an upper specification limit has been specified. Both the Cpk and Ppk values indicate good process capability/performance. Figure 3 Process capability graph showing the within subgroup variation (data from within the different components of the device) compared to the overall process variation. 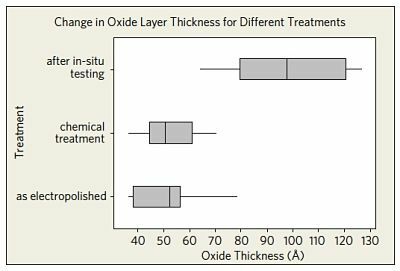 The effect of different treatments on the oxide layer thickness is shown in Figure 4. The observed passivation layer thickness after in-situ tests of a group of devices in an accelerated human model environment led to a statistically significant increase in the oxide layer thickness (compared to the as-electropolished values and the values measured after chemical treatment). Figure 4 Effect of different treatments on the oxide layer thickness compared to the overall process variation. Auger Electron Spectroscopy was also used to analyze the oxide layer thickness in specific metal to metal contact areas of the in-situ tested devices. The thicker oxide in areas of metal to metal contact showed the human model environment may lead to localized surface modifications (Figure 5). 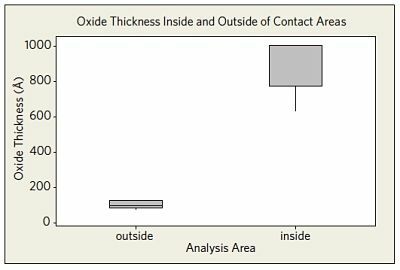 Figure 5 Oxide layer thickness measured in metal to metal contact areas of the in-situ tested devices compared to non-contacting areas.